Hit the spot with chocolately goodness! Sold individually. Single-serving-sized bags of either plain or peanut M&M's crafted with Tootsie Pop centers to look like flowers. 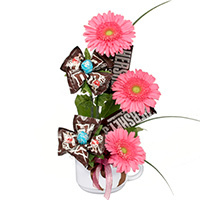 Arranged with Hershey bars, fresh gerbera daisies, and beargrass in a mug. Bloom and mug colors may vary. If you prefer certain colors, please list your 1st and 2nd color choices in the Special Instructions box when ordering. Also available in a Skittles version, Sugar Rush #170710. 14oz ceramic latte mug measures 4"Hx5"W.
Your arrangement is handmade by a skilled designer; contents and dimensions may vary.